Diaphragmatic breathing or deep abdominal breathing should come naturally to us. As young children we automatically take deep full breaths. As we grow older emotional stress and social factors like, the desire to maintain a flat stomach, cause adults to rely on shallow chest breathing. This is unfortunate because diaphragmatic breathing can enhance your health and well being. Diaphragmatic breathing reduces stress. When we encounter physical danger or emotionally distressing events our bodies respond by activating the sympathetic nervous system. The sympathetic nervous system triggers our physical responses to perceived danger, the fight or flight mode. The fight or flight mode will cause our digestion to slow, heart rate to increase and adrenalin to enter our bodies. If prolonged stress keeps your sympathetic nervous system active your health can deteriorate. Diaphragmatic breathing can stimulate your parasympathetic nervous system. The parasympathetic nervous system is responsible for “turing off” the sympathetic nervous system’s response to stress. 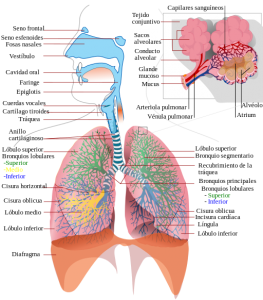 Diaphragmatic breathing supports the immune system. The lymphatic system is a component of our immune system that is responsible for disseminating disease-figthing, white blood cells throughout our body and aids in the disposal of cellular waste and bacteria. Diaphragmatic breathing optimizes the flow of the lymph system thus, promoting and strengthening our immune systems. Diaphragmatic breathing can improve athletic performance. Diaphragmatic breathing draws air towards the lower parts of our lungs. The lower parts of are lungs are more effective at delivering oxygen to our body. Thus diaphragmatic breathing does a better job of supplying your muscles with the oxygen they need to preform athletic feats. Shallow chest breathing can lead to muscular imbalances. For example, shallow breathers tend to overuse their upper traps and underuse the lower traps. The imbalances related to shallow breathing can crate faulty movement patterns in athletes . Diaphragmatic breathing can help correct some of these faulty movement patterns. Find a quiet rallying space to practice in. Lay down and place one hand on your chest and one hand on your belly. Bend your knees so that your feet are flat on the floor. Pull air into your belly first and then into your chest. If you do it correctly, you’ll feel the hand on your belly rise for the first two-thirds of the breath, then the hand on your chest will rise for the last-third of the breath. Practice this for at least 5 minutes. If you are interested in improving your well being deep breathing exercises are a good place to start. Diaphragmatic breathing is one of the easiest and lowest cost ways to improve your health. In addition to being accessible, diaphragmatic breathing also imparts a wide variety of benefits. From improving your state of mind to boosting your immune system and athletic performance diaphragmatic breathing can help.